The NIKKEN management team are delighted to announce that NIKKEN AG, a subsidiary company of NIKKEN Kosakusho Europe group, and Beat Baumgartner of Triag International & Tribur Invent GmbH, have come to an exclusive agreement for the marketing and promotion of the full range of NIKKEN CNC Rotary Tables and accessories in the Swiss marketplace. The agreement was one of many partnerships that were reached during EMO MIlano in October 2015, with additional alliances being made with a number of global organisations. This Alliance in the Swiss marketplace will create a dynamic ‘one stop’ design, supply, install and after sales proposition for standard, advanced, and bespoke CNC rotary tables and work holding solutions to the Swiss machine tool sector and its many users. In addition to the provision of NIKKEN products to the Swiss market, Tribur Invent GmbH have an enviable reputation throughout the region for the servicing of machine tools and accessories – making this new association doubly advantageous for both companies. Speaking about the move, Beat Baumgartner said “these are exciting times for NIKKEN and Triag/Tribur. Our new alliance creates a dynamic partnership - building on existing reputation while combining expertise and additional resources to ensure customers continue to receive the exceptional service that is part of both Companies ethos”. 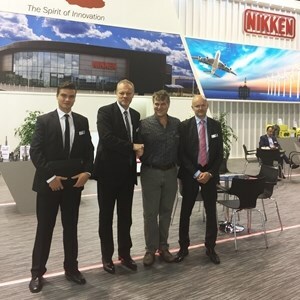 Pictured left to right are Lucas Herzog; Group Product Manager for Work Holding Accessories, Tony Bowkett; NIKKEN Group Managing Director, Beat Baumgartner; Triag International CEO and Carl Hughey; NIKKEN group Sales Director. Further information is available from NIKKEN Deutschland GmbH.